The funeral Mass for Redemptoristine Sister Alice Gertrude Haslag was celebrated Feb. 4 at the Redemptoristine Chapel in Liguori. 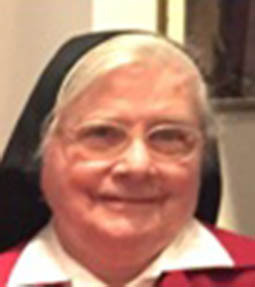 Sister Alice died Jan. 29 at St. Andrew at Francis Place in Eureka. She was 93 years old. Born in Loose Creek, Mo., in October 1925, she was the daughter of the late Mary (nee Backas) and Charles Haslag. She entered the Sisters of St. Mary in St. Louis and made her first profession in June 1948. Trained as a physical therapist, she ministered in hospitals in St. Louis and other places served by the Sisters of St. Mary. She earned a doctorate in physiotherapy and taught physiology at St. Louis School of Medicine. While on a sabbatical renewal program after the Second Vatican Council, she spoke to Redemptorist Father Raymond Miller about following a call to the contemplative life and was introduced to the Redemptoristine Nuns. In October of 1968, she transferred to the Redemptoristine monastery at Liguori and made solemn vows in 1970. She used her previous training in the medical field to help the sisters in many ways. She was a formator, an infirmarian and seamstress at the Liguori monastery. Her quiet presence reflected a deep spirit of prayer. She was a woman of great compassion for the oppressed under South African apartheid where she served for a number of years, for her patients and for her own sisters in the community who were suffering. She is survived by a sister, Margaret Schaefer of Linn, Mo.